Integrate to Contact Form 7 seamlessly! WordPress users can add a Contact Form 7 / ActiveTrail registration form to their website, seamlessly adding new users to ActiveTrail’s recipients list. WordPress is the biggest and most popular online publishing platform in the world. Therefore, we in ActiveTrail have found it essential to develop a contact form 7 plug-in which allows an easy and instantaneous interface with our email marketing system. WordPress integration allows your users to sign up for your newsletter right from the WordPress interface. Add a newsletter sign up form anywhere on your WordPress site and start acquiring new users without having to lift a finger. Why do you need WordPress integration? The WordPress plugin allows you to automatically sign up new users to your newsletter through your website. Increasing the size of your recipient list is important in order to maximize the efficiency of your email marketing and bring in bigger profits. 1. 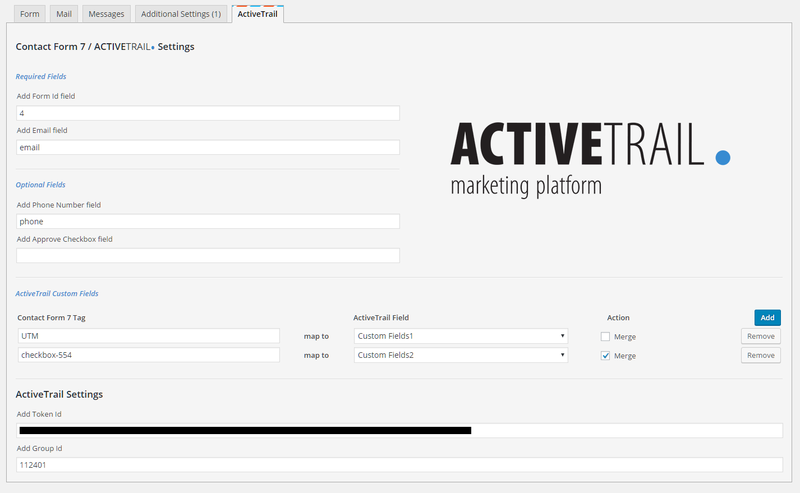 Download and install ActiveTrail’s plug-in from the WordPress interface. 2. Create a sign-up form with questions to your liking (Name, Address, etc.). 3. Place your sign-up form anywhere on the website. 4. Start acquiring new clients right away. Now that you have a sign-up form to build up your recipient list, start working on designing your newsletter and get it out to as many customers as you can.